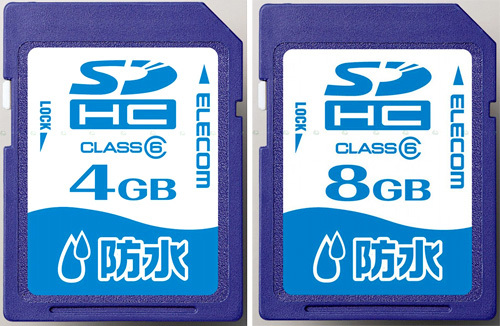 Elecom's Waterproof SD Cards | OhGizmo! I’ve seen plenty of demos where a digital camera is sitting at the bottom of a fish tank to show how waterproof it is, but these are the first SDHC cards I’ve seen that are just as H20 friendly. Elecom’s new 4, 6 and 8GB Class 6 SDHC cards are completely waterproof so even if you happen to drop your non-water-friendly digital camera overboard, at least all of your vacation photos won’t be destroyed. Assuming you can retrieve the camera that is. There’s no word on pricing at this time, but you can probably expect them to run just a bit more than your standard SDHC card. But aren't all memory cards kinda-sorta water-proofish? But wait, flash memory keep data by storing tiny bits of charge in millions of capacitors… oh..